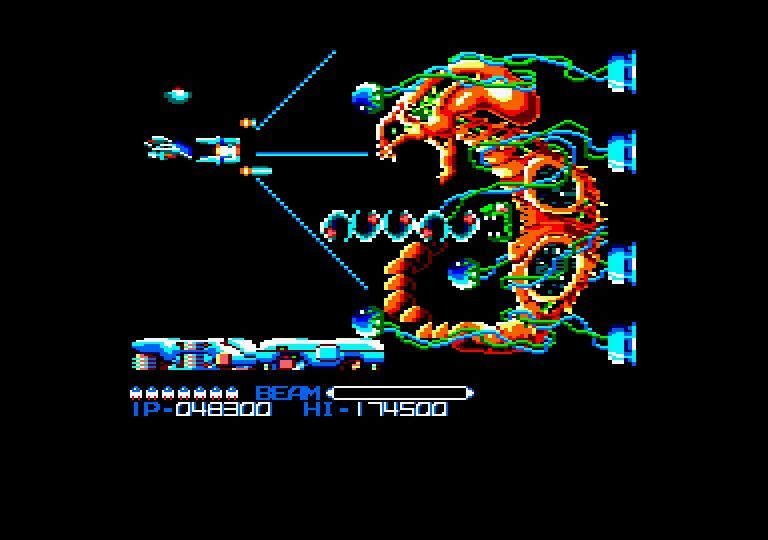 The original version of R-Type on the CPC was a Speccy port, quickly shunted onto the CPC in a few weeks to save money. Now the Speccy version was excellent but the port was slower, and uglier. It wasn't at all optimised for the CPC. Still played well though but it wasn't the classic the Speccy version was. Roll forward 25 years and some loons recoded the entire thing to turn it into a proper CPC game. Although its been out for a while now, you can now play it online. It is a remake in some senses, but alot of the game is running on the 25 year old code. Stuff like how the enemy waves appear etc are all the same as the original. What the developers have done is rewrite all of the graphics and sound from scratch and try and turn it into the ultimate 8 bit version of R-Type. NB: The Java emulator is a little glitchy and ugly but it's pretty good. If you do have a proper emulator on your machine, play it there instead. It's just smoother and better.